This anti-fat shot drill requires quite an advanced technique that might feel a bit awkward at first. 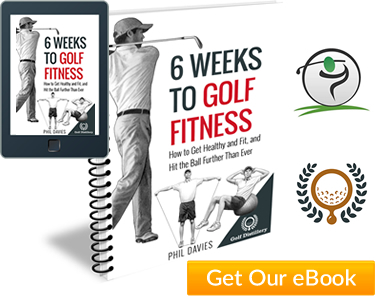 However, with a bit of practice you’ll quickly improve and it will give you a lot of confidence when you come to strike the ball on the golf course. The drill above is great for getting a feel for proper and complete weight transfer. 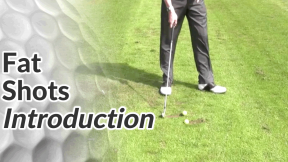 Don’t be put off by how difficult it might look on camera – it doesn’t take a lot of practice to master the sequence and even though you won’t hit the ball perfectly every time at first, once you’re confident with this drill it will do wonders for your confidence over standard golf shots. Use a short iron and tee the ball up on a small tee peg. Start by taking your normal set up. As you swing back slowly, allow your left foot to come completely off the ground and bring it next to your right foot, so that both feet are together. At the top of your backswing, as you move into the downswing, shift your left foot back across and plant it on the ground in it’s original position. Accompany this move with a big drive from the hips and a nice, committed weight shift into the newly planted left foot. 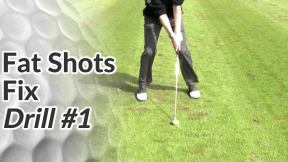 This is a difficult drill to master at first, but when you do you’ll be the best ball striker you know! If you hit your fair share of fat shots, there’s a good chance you also hit the golf ball thin (or top it) on occasion too. 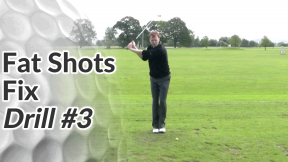 One of my favourite drills to improve this solid ball striking can be found in the Anti-Thin / Anti-Top section of the site. I’d encourage you to watch it and make it a part of every practice routine over the next few weeks. 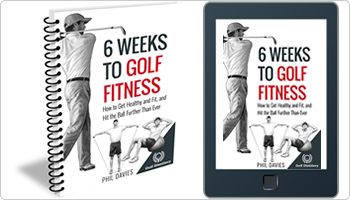 From experience with my day-to-day students, I’m confident it will all but eliminate fat and thin golf shots from your game.